Continuous monitoring of process media on machines and equipment contributes greatly to process security. In addition to pressure and temperature, flow is also something that always needs to be kept an eye on. The new thermal flow controllers with IP 67 protection detect the flow of liquid media in direct contact, for example on machine tools, pumps and compressors. And in so doing they ensure machine functionality. The Balluff range includes various form factors. Available are both screw-in and inline versions for various flow rates and pipe diameters, with convenient M12 plugs for connection. Depending on the model an LED bar or display visualizes the flow quantity. Since they have no moving parts, they are highly resistant to contamination. 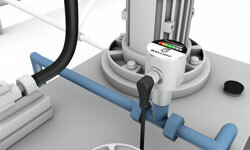 Flow controllers reliably detect a reduction in the flow, for example when there is a failure of the flow pump, a clogged filter, or a leak in the hose system. Another key area of application is monitoring the cooling lubricant flow in machining centers to provide protection for tools and increase their service life. Flow controllers are also ideal for controlling other liquid media, such as coolants.